We are happy to announce the general availability of MariaDB MaxScale 2.3.2. MariaDB MaxScale is the key application-facing component for MariaDB Platform X3, also announced today. 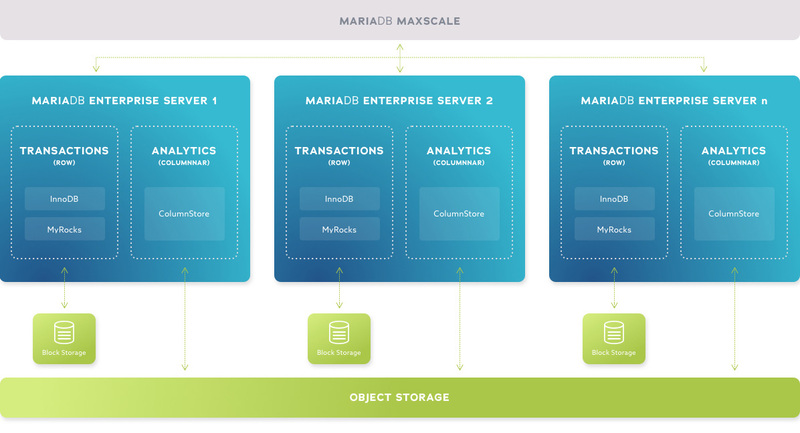 MariaDB MaxScale serves as the integrated data access entry point of MariaDB Platform that hybrid transactional and analytical processing (HTAP) applications connect to. Seamless data streaming from Multi-node Galera Cluster via binlog server: Continuous data streaming from Galera cluster even in case of a node failure without manual intervention. ColumnStore Monitor: The new csmon monitor can be used to monitor ColumnStore clusters versions 1.2.1 and newer. This monitor that holistically checks the status of the entire Columnstore cluster before routing queries to the UM nodes. Adaptive Routing based on Server Load conditions: Routing based on actual load conditions of servers as measured by response time and probabilistic selection. A new slave_selection_critera value of ‘ADAPTIVE_ROUTING’ in Read Write Split router. Binlog filtering: A new filter module that allows the client side stream of binlogs to be filtered. Table Family Sharding: The SchemaRouter is now capable of table family sharding. Always consistent reads: A new causal_reads parameter that enables distributed consistent reads with MariaDB version 10.2.16 and newer. Comment Filter: A new comment filter to prepend statement received with a comment before it is sent further to a server. Please see the comment filter documentation for more details. Syslog Improvements: It is now possible for the end user to specify the syslog facility and level for authentication errors. MaxCtrl: There is now a new command classify <statement> to check if and how MaxScale classifies a specific statement. Watchdog: Systemd Watchdog can be enabled to monitor and take corrective action if MaxScale process hangs for more than watchdog duration. For additional details, please see the release notes. Also, look for more blogs that further dive into these capabilities in the coming days and weeks. Dipti Joshi is Director of Product Management at MariaDB.